Andrew McGregor is one of over 100 Makers joining us at DTLA Mini Maker Faire 2018 this Saturday, December 1, from 10 a.m. to 4 p.m. at Los Angeles Central Library. Andrew was kind enough to answer some questions about himself, his project, his involvement with the Maker Movement, and what he is looking forward to at this year's Faire. What does being a Maker mean to you? Being a maker means cultivating the ability to physically dream new creations that create new dreams. How did you get into the Maker Movement? I wrote and directed a sci-fi film, a love story between a rat and a robot that guide humans out of a land mine field, and wanted to make the robot in my movie a reality. I then started mixing microcontrollers with puppetry and went from there! What do you think about public library involvement in the Maker Movement? Mixing Maker resources with public libraries is a fantastic way to enhance and revitalize their institutional role in the digital age while also helping solve some of our society’s pressing educational and cultural challenges. What do you hope attendees take away from this year's Faire? I hope attendees see or experience something beyond what they thought was previously possible and then have an epiphany that they can understand and contribute to that same incredible thing! What is your background and how did you get involved in artificial intelligence? I have a humanitarian and social enterprise background, in addition to being a philosophy major. So, AI and its pragmatic, as well as moral potential, are of natural interest to me. More specifically, I'm working on a research project to make landmine seeking rats bionic by developing wearable communication technology that will, hopefully, in the future, enable the animals to communicate to humans where landmines are. AI is crucially important in enabling the inter-species communication required to achieve this vision. 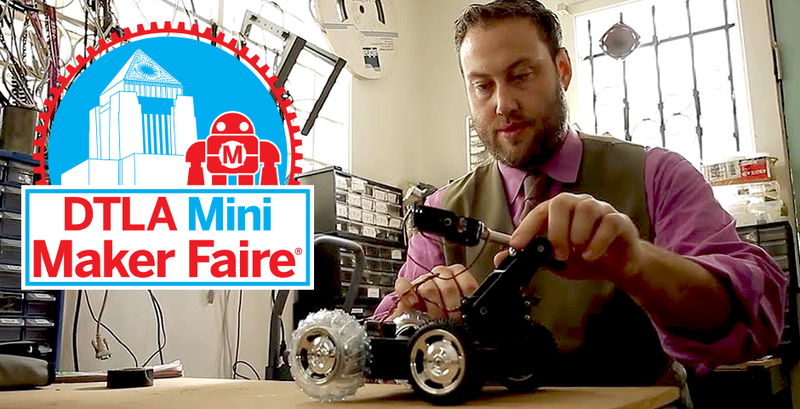 What are you exhibiting at the DTLA Mini Maker Faire this year? I am exhibiting technology in which AI-assisted wearable tech designed for guinea pigs determines when the guinea pig is grooming. This is functionally similar to what is required of landmine seeking rats to notify a human when they find a landmine via wearable technology. I hope that it opens people up to the possibilities of contributing to humanitarian purposes and also to the entire fascinating realm of inventing ways to use technology to create new forms of inter-species communication! Can you think of an example of a time you inspired an individual to make? I was featured as one of "America’s Top Makers" in a digital series that had a wide reach and I received lots of positive responses from that. What is your latest Maker adventure? I am curating the Robot: Love art show in which robots with artistic designs are placed with conventional art inspired by robots. The show opens December 8th at The Hive Gallery in Downtown LA. Currently, I am collaborating on a performance piece in which the choreographer Dana Wilson will dance with robotic furniture. I also just finished a new robot that symbiotically combines plants and robotics that was made with Kuan Ju Wu and inspired by his other work. What do you think is the most important attribute about being a Maker? I think the most important attribute is a vast curiosity coupled with an unreasonable faith that all dreams can be forged in reality. Who They Are: David spent most of his career in visual effects before moving onto other avenues of creativity including robotics, machining, and 3D printing. What They Do: David 3D prints fabric that can be used for cosplay fashion and large sculpture. He's looking forward to sharing his projects, his successes, and his failures with the Maker community. Why They Rock: David inspires us to push the boundaries of what 3D printing can make and how we can use it for different purposes. Who They Are: Cecilia has been drawing and making things all her life and has recently started exploring electronics and robotics. What They Do: Cecilia creates hacked and reimagined toys using electronics and robitics, giving them new life. She will be providing attendees the opportunity to control and re-program her toys at the Faire. Why They Rock: Cecilia's Playful Robotics show how accessible, simple, and fun robotics and hacking can be. Who They Are: Jessica is a Maker, software engineer, and dancer who enjoys dancing, sewing, coding, and cooking. What They Do: Jessica seamlessly embeds electronic components into dancewear and other fashions to give that extra bit of shine. Why They Rock: Jessica's clothes are designed to be danced in and even washed like normal clothes (once the batteries are removed, of course!). DTLA Mini Maker Faire 2018 takes place this Saturday, December 1, from 10 a.m. to 4 p.m. at Central Library in Downtown Los Angeles. This event is free, open to the public, and fun for everyone! Please register for your free tickets on our Eventbrite page. Check out the schedule of talks, performances, and workshops to help plan your day at the Faire. Please note that space is limited for all ticketed workshops. Tickets will be assigned on a first come, first served basis at check in.